This area, which includes pretty villages like Güéjar Sierra, Monachil and Dílar, is one of the most beautiful and spectacular parts of the Sierra Nevada. 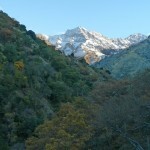 Fortunately, this area is close to Granada, so it is relatively easy to reach. You can either base yourself in Granada or one of the villages, and many of the walks are accessible by public transport.